Shaped cards are so interesting and cute.When I first started making cards I used templates from the net or books,nowadays I try to design my own templates as its quite a lot of fun!I had a lot of fun designing and jazzing up this dagger shaped card ! 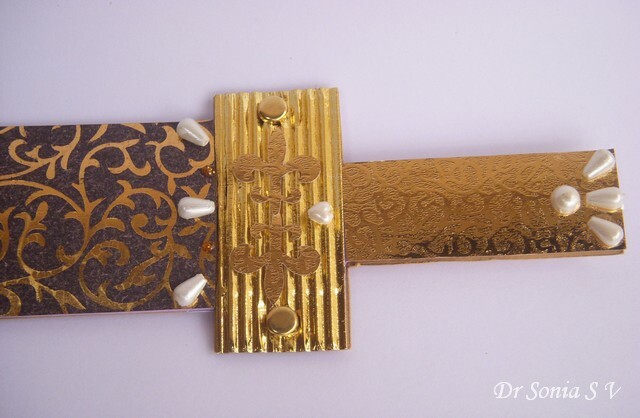 I stuck pearls and inserted golden brads to glamorize the handle of my dagger shaped card. 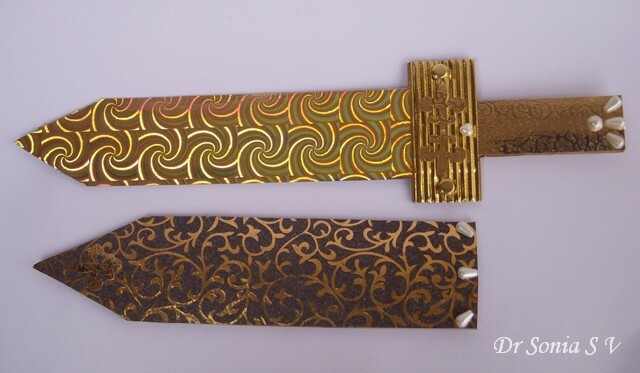 I used 3 D holographic shiny paper for the dagger blade.It think it will be a fun card for a little boy to play with! 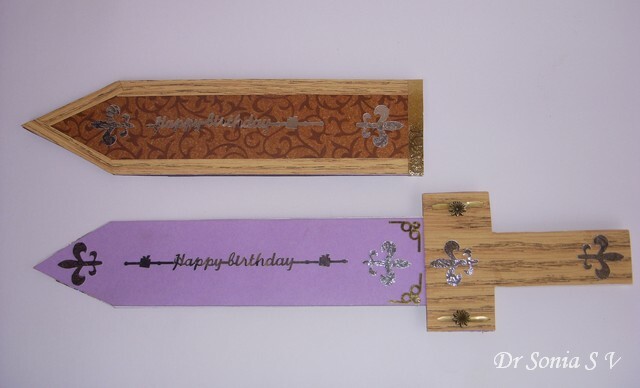 On the other side I used wood colored paper recycled from an old wedding card.Added a Happy birthday greeting on the dagger inside the card ! 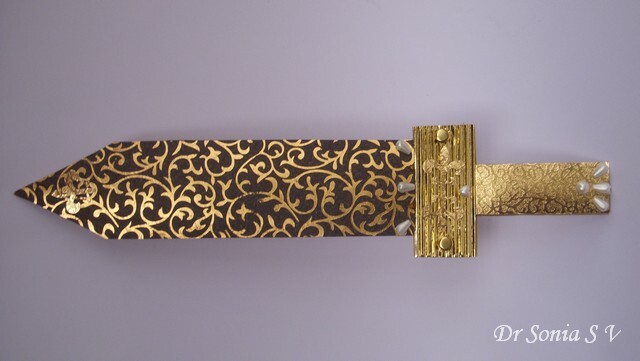 Here is the closeup of the handle with a flower on the brad! 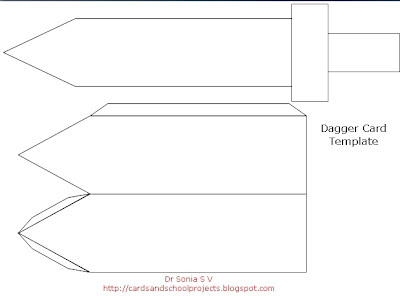 I actually created the dagger shaped card by playing around with my scorpal but the tutorial for that is too lengthy and boring so designed a simple template for the dagger shaped card. 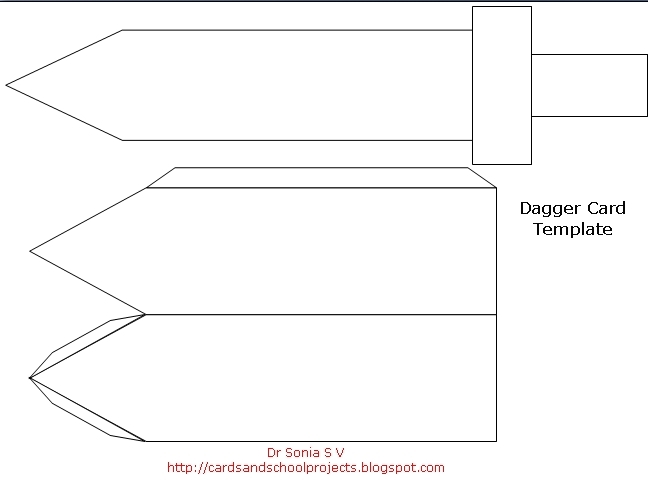 Make the dagger with thick card [or stick 2 card pieces together] as other wise it will be floppy when you draw it out. 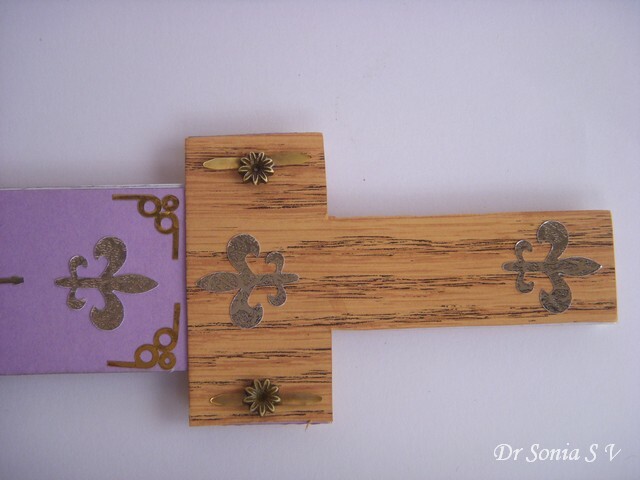 Bend the tabs inwards,apply glue and stick to complete the sheath of the dagger shaped card. 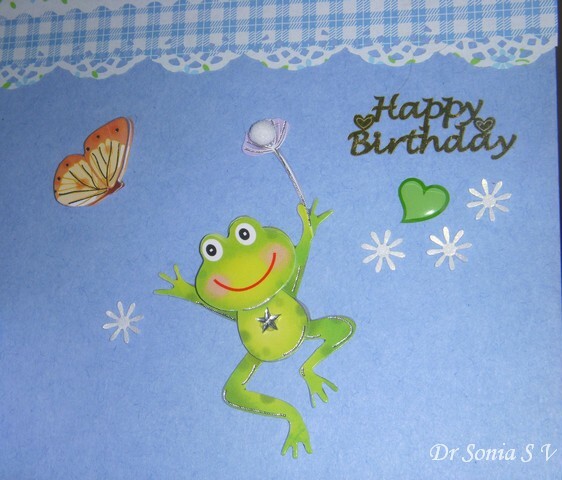 This card is surprisingly quick to make and doesn't require a lot of embellishing..It will be a fun card for party invitations or birthdays especially for little boys. 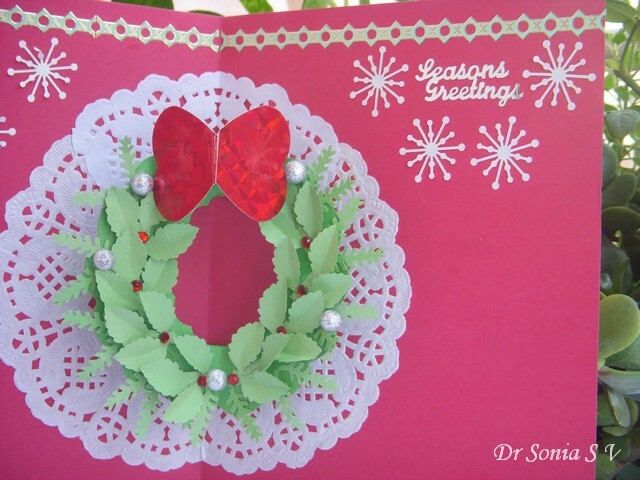 Edited:This card was featured on Beyond Grey Challenges as the most daring creation! Thank You BCG! Recently I held a recycling challenge at Yvonne's Do More with Less and chose 5 super talented ladies as winners to feature on my blog here. Katy recycles an amazing variety of objects including plastic bags !--- she floored me and I am sure will enthrall you too!! 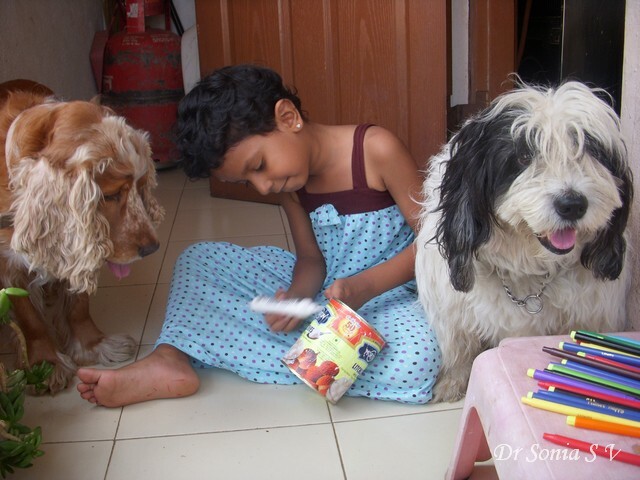 Katy do tell us a bit about yourself and your crafting journey. I started scrapbooking over 15 years ago. My introduction to scrapbooking was a scrapbook I made for my high school band class. 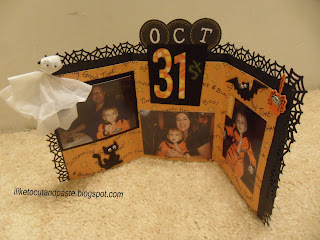 Later, a friend reintroduced me to scrapbooking and from there I got into cardmaking. It wasn't until I went to a few Creating Keepsake Universities (a scrapbook convention that is nothing but a weekend of classes and crops) that I really really understood how big this craft is and how to incorporate techniques and different materials into projects. In June of last year I took my love of paper crafting to the Internet. Ilovetocutandpaste.com was born. My husband is my biggest supporter in my blog. Every Tuesday I do a Tidbit Tuesday which can range from a product to a technique, to a full project. On Fridays I post a project that way my blog is active at least twice a week. I participate in online challenges that help stretch my creativity, and I also share them on my blog. 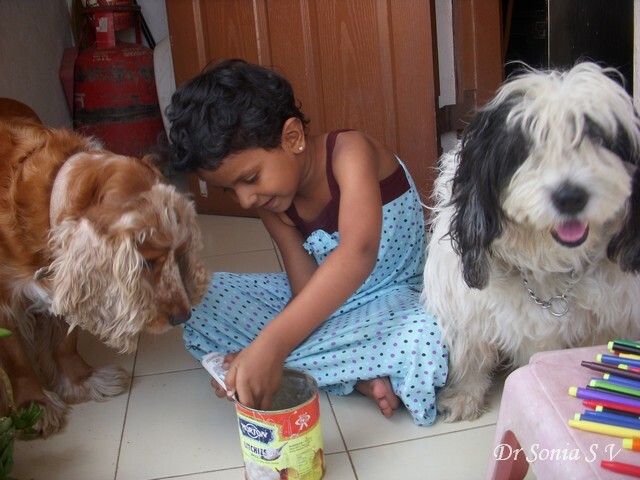 I visit other blogs (including Dr. Sonia's) and find so much inspiration and knowledge. 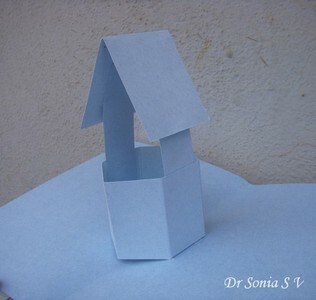 Paper crafting is my favorite hobby. I mostly make cards and scrapbook pages. Lately, I have begun making tags which is great if you are short on time. Sometimes I will alter a box or a jar. Mixed media projects are also becoming one of my favorite things to make. If I can use something that would have otherwise been thrown away, I am that much happier. 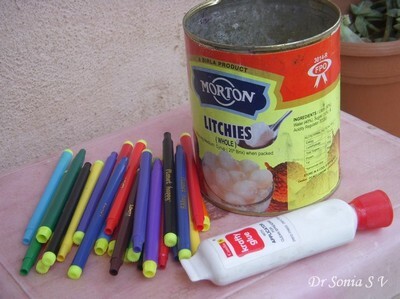 Some Recycling ideas and tips from Katy.. I think that you have to look at household items in a different way. 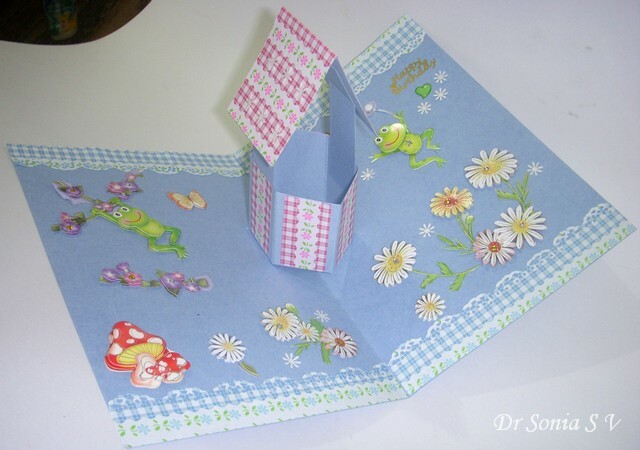 For example, if you have a manual cutting machine (Cuttlebug, Vegabond, etc) you can cut cereal boxes and make flowers or whatever dies you have on hand. Then you can paint them so now you have a customized embellishment. You can also use ads and newspaper to do the same thing. 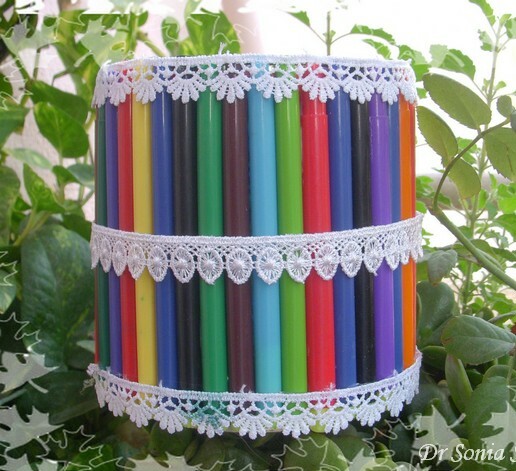 Or even wrapping paper left over from an opened present. 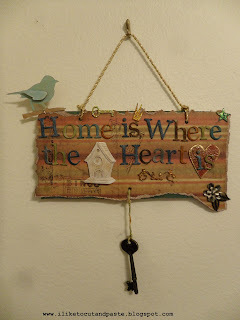 One of my favorite things to make is to take a flap of card board and decorate it and turn it into a wall hanging. For these I go where ever my creativity takes me (after I use what the online challenge called for.) I can incorporate any number of techniques in creating these. I took my flowers a step further and added colors to the bags. 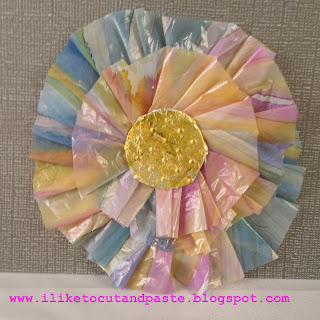 Because plastic bags are non-pourous you can use Ranger’s Alcohol Inks on them. Too much fun! A few months ago I bought some Cosmo Cricket Glubers (really big and super sticky glue dots to make ribbon flowers) and used strips of inked plastic bag to make the flowers. It is a bit tedious because the plastic bag easily sticks to the Gluber but what a wonderful result when it is finished! I have also made 3 dimensional ghosts out of white plastic bags. For these, googly eyes are a must! I loved exploring Katy's works and here are some words of wisdom from my new found blogger friend.. Thank you so much Dr. Sonia for having me as your first guest! It has been a true honor and pleasure! Recycling is a lot of fun and is friendly on your budget! 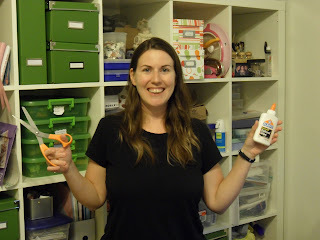 Until next time my friends…Reduce, Recycle, and most important Reuse for your art projects! Isnt she just amazing....Do drop over to Katy's blog to see her amazing work and tutorials. Fairy tales and wishing wells fascinate me. I was just playing around with the scor pal today when by accident I designed this wishing well...it was amazingly easy to make and here is the wishing well pop up card.
. Especially love the bit of cotton in little frog's dandelion flower! Here is the other froggy hopping from the flower vines! 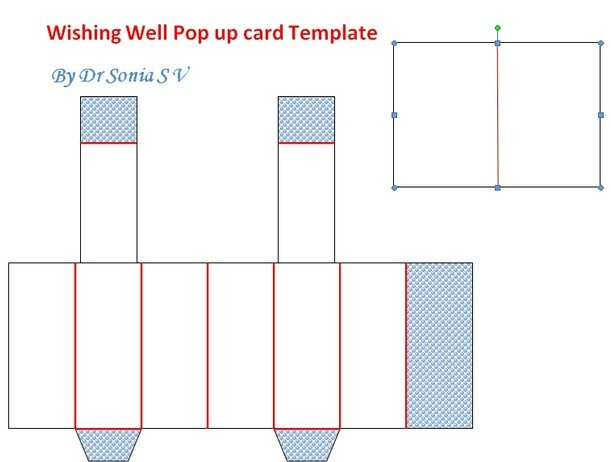 Sharing the template just to let you know it needs just 2 pieces of card and some folds to make it! 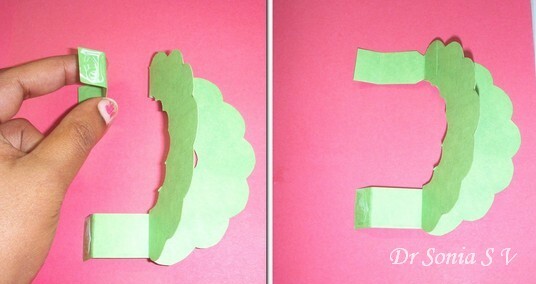 Once I take the photos shall share the pop up card tutorial. Do forgive the blurry photos--its the side effect of being crafted and photographed past midnight! 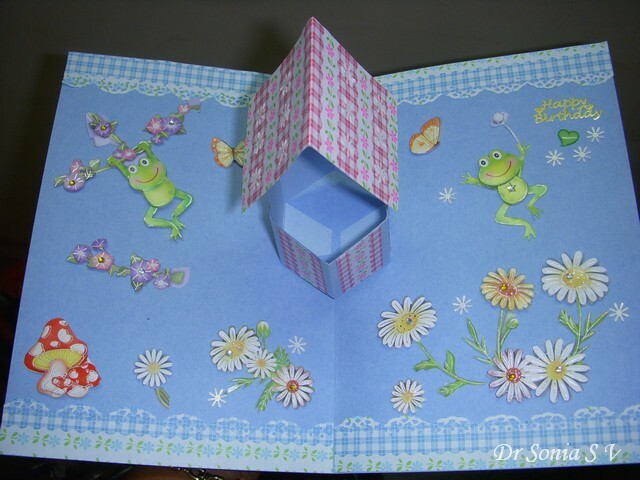 This wishing well pop up card is inspired by my friend Jessica's wishing well project. Here is the link to the 3D wishing well flower vase also inspired by her . 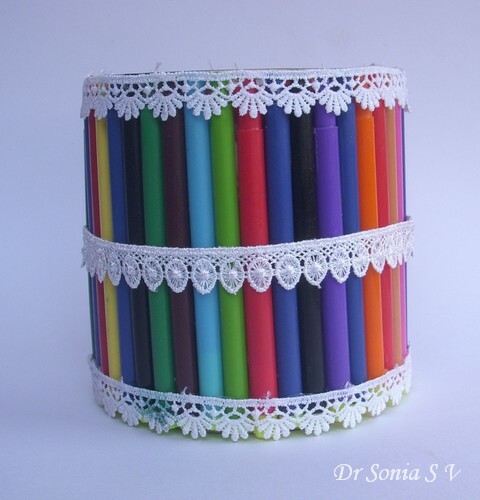 Recycling is so fun when we can transform throwaway objects into beautiful or even useful objects! I hoard many crazy stuff including dried up sketch pens and tin cans and every now and then try to create something with my "junk"! Snowy [ the Lhasapso] was more interested in posing for the picture! 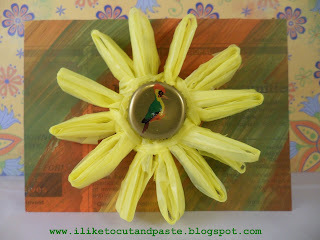 This was a quick though somewhat "sticky" recycling craft ! Jazzed it up a bit with some lace to make a colorful container. I got this idea from my friend Jessica's Altered Can Project. 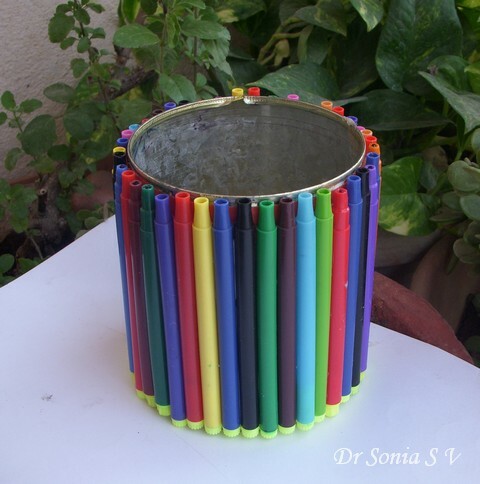 Do tell me how you liked this simple idea to reuse those used up markers and pens. 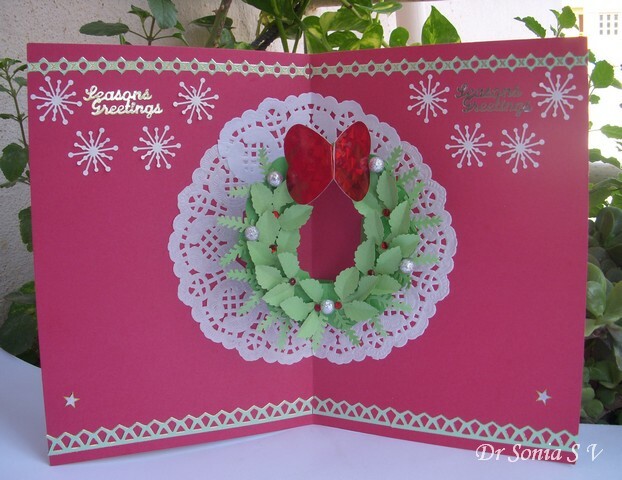 Here is the promised Pop Up wreath Card Tutorial.The earlier pop up wreath card was made with basic materials but I went all out and used a variety of my beloved punches for this fancier pop up Christmas card. Scoring tool- Even though I use my beloved Scorpal as its so much easier and quicker, just a blunt knife or an old pen [whose ink has run out] will do. Make 4 supporting tabs from thick card stock by scoring 2 inch strips at 0.5and 1.5inches to give a tab which measures 1 inch in the middle and 0.5 inches at either end.Valley fold all the creases. 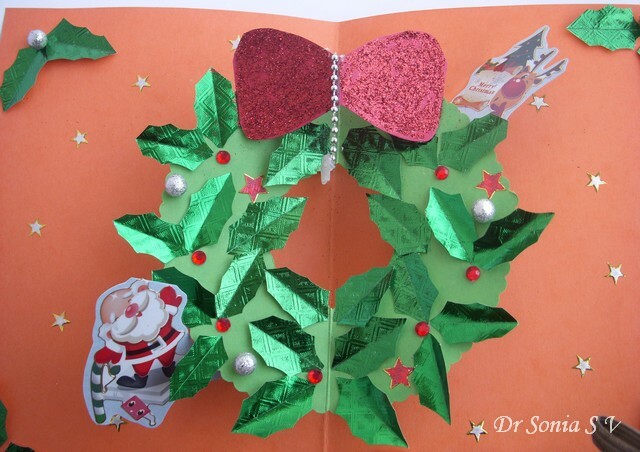 Take another tab ,apply glue and stick to the central upper part of the other half once a day your pop up wreath as shown.Note the direction of the supporting tabs and the area where the glue is applies on the lower supporting tab. Stick the lower tab flush with the central crease of the base card. Apply glue on the area shown on the upper tab and stick it to the other half of the base card again flush with the central crease as shown. 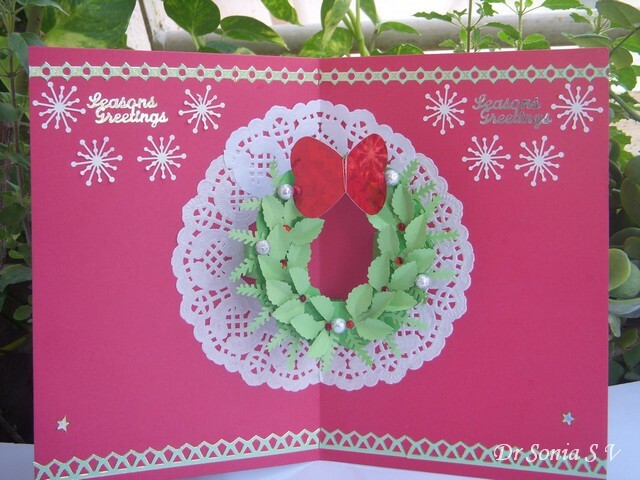 Add 2 more supports at the 2 edges of your wreath in a similar fashion.Apply glue on the tab as shown,fold over your wreath and stick the glue tab.Apply glue on the other end of the tab as shown and close the base card and allow the tab to stick. In a similar fashion stick the tab on the other side of the pop up card . 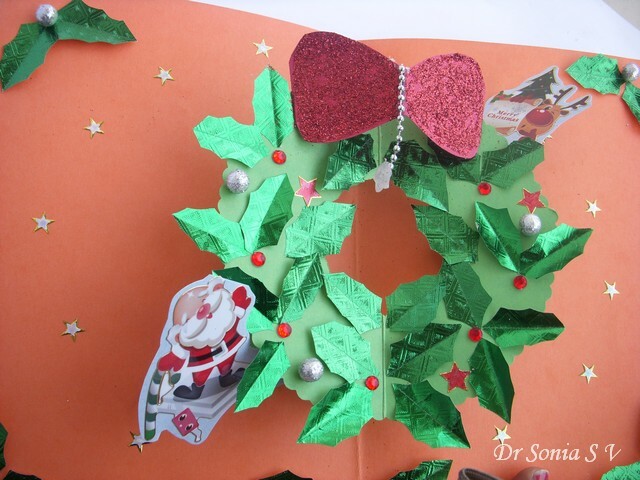 Tip: You wont go wrong in the pop up mechanism if you glue one part of the tab to the wreath and then apply glue to the other part and let it find its own sticking point by folding the base card! Making the wreath was so easy I became a ambitious and added a 2nd pop up element on top of the pop up wreath! 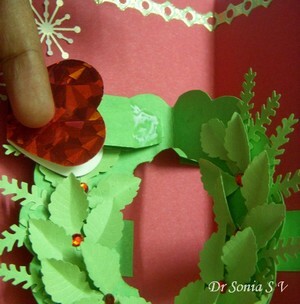 This is a super simple pop up mechanism and you can use this pop up bow on a box, wreath or maybe a baby's head! create a quick bow from 2 punched hearts as shown here. 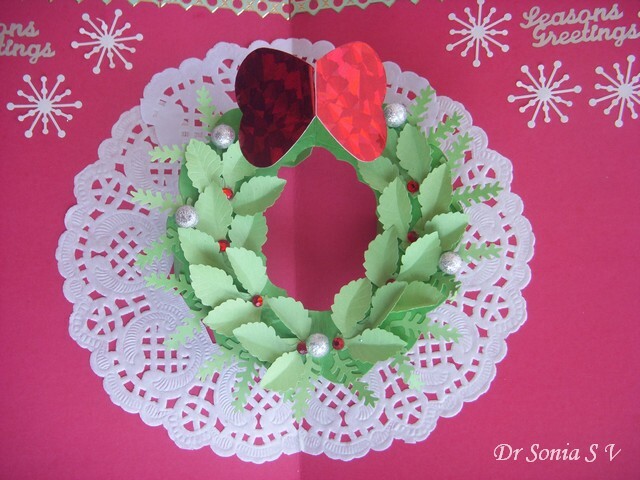 I scored the edges of 2 hearts as shown, cut off the edge of one heart and stuck it to the folded edge of the other heart to make a folded bow for the pop up card. This bow even looks like a butterfly so this mechanism can be adapted to make a pop up butterfly! Score and fold 2 supporting tabs.The size depends on the size of your bow- My tabs are 0.5 inches at either end and 0.75 inches wide in the center. Stick the tabs as shown on the underside of your bow.Fold over the bow and apply glue to the tabs as shown above. 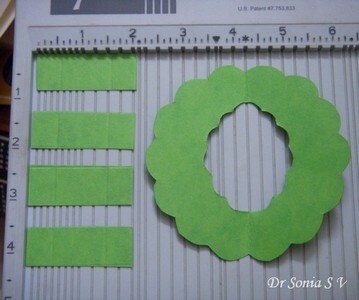 Stick one glue tab near the central crease of the pop up wreath and fold over so that the other glue tab sticks by itself .Here is how the pop up bow mechanism looks. Warning: Making pop up cards does require a bit of concentration but I guess that is just what we need sometimes to distract over selves from life's stresses! This one is especially for you my friend Jessica since you love wreaths so much! 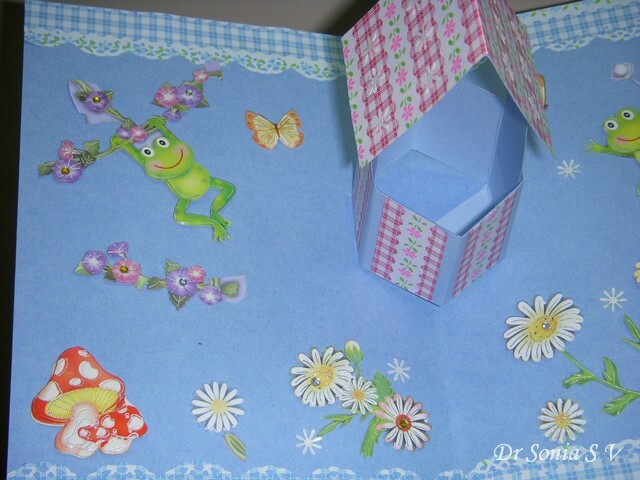 I love making pop up cards and designing one from scratch is fun though I must admit I it does get a bit crazy at times when things dont work out just the way I want! Making the wreath and the popping up bow was easy but getting the Santa and the Reindeer to peek out from under the pop up wreath did require a bit of paper engineering hair pulling! 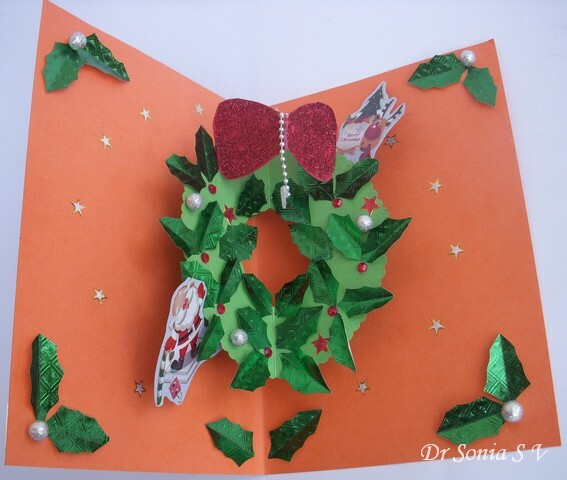 This card is made entirely from easily available stuff and I have not used any kinda punch or fancy tool. 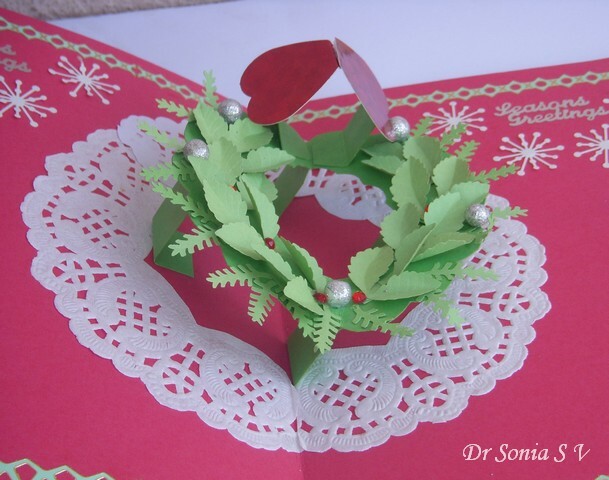 The green holly leaves were handcut from locally available glitter paper, the red rhinestone berries are "bindis" [ used by our Indian ladies to adorn our foreheads!] and santa and the reindeer are stickers. 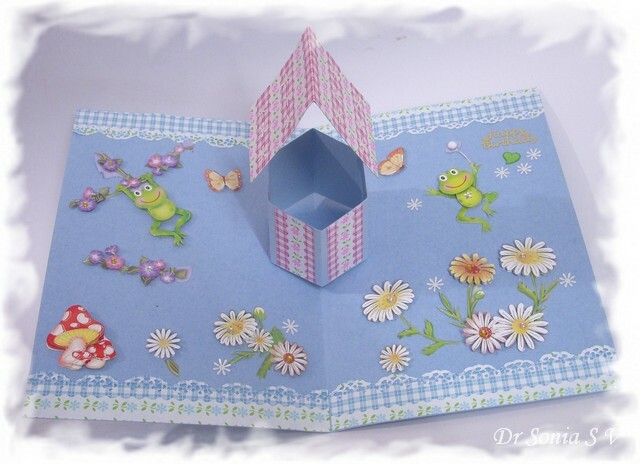 Though not made of exotic materials this type of card does have a lot of fun element and you dont need any fancy stuff to make it just paper,scissors and glue!